This is part of a two-part essay series on the emergence of ghosts in poetry. Take a look back at There’s a ghost in my poetry, Part 1: G.C. Waldrep and John Gallaher’s Your Father on the Train of Ghosts. If Harold Ramis, in Dr. Egon Spengler’s infinite wisdom, has taught us anything it is this, that 1) print is dead 2) collecting molds, spores, and fungus can be a fun and exciting hobby, and 3) ghosts need busting. Then the ‘90s reared their slightly less fuzzy head, and Demi and Swayze showed us the tender side of ghosts—that some ghosts just want to make sweet, clay hand-love to us. Matthew Rohrer’s Destroyer and Preserveris the first collection of poetry to make sweet, clay hand-love to me in a long time, albeit less sloppy. For those familiar with Rohrer, this book follows a trend of departure from the playful personification of the inanimate that so characterized his first collection, A Hummock in the Malookas (Norton, 1991), toward an often more personal and always more sincere poetics. The poems in Destroyer and Preserver are concerned with domestic life, with fatherhood, with being a small human in a big city full of humans and ghosts. Here are some sightings. Spicer’s ghosts work much like Spicer’s muse: the poet is an antenna, the poem a transmission from outer-space. “[T]he universe / is a long sentence,” writes Rohrer, and “From Mars” is written as such; devoid of punctuation, the sentences run together as if the poem really were dictated by the universe and it was all Rohrer could do, busily slapping away at his keyboard, to keep up. One cloud turns pink at sunset. A bomb falls on a house in the desert. to be washed and put away. This book is Rohrer at his best. The poems feel organic, full of destroyers, preservers, and ghosts: “a small cloud / that looks like an enormous flea / crouches over the city.” And I’m inclined to agree with our speaker-poet: “I think the future / belongs to the ghosts / sweeping the sidewalks / with their wedding dresses.” Though, poets, it might be time to change the ghosts in all those poems you’ve been writing into robots. This puppy just hit the shelves. Matthew Rohrer is the author of A Plate of Chicken (Ugly Duckling Presse, 2009), Rise Up(Wave Books, 2007) and A Green Light (Verse Press, 2004), which was shortlisted for the 2005Griffin Poetry Prize. 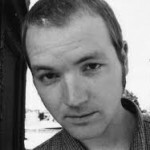 He is also the author of Satellite (Verse Press, 2001), and co-author, with Joshua Beckman, of Nice Hat. Thanks. (Verse Press, 2002), and the audio CD Adventures While Preaching the Gospel of Beauty. He has appeared on NPR’s “All Things Considered” and “The Next Big Thing.” His first book, A Hummock in the Malookas was selected for the National Poetry Series by Mary Oliver in 1994. He lives in Brooklyn, New York, and teaches in the undergraduate writing program at NYU.